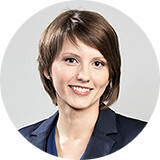 Kathrin Karner studied business administration and commercial law at the Vienna University of Economics. During her studies, she specialised in the areas of economic training & educational management, and trade and marketing. She currently works in the human resources and organisational division, laying her focus on team building. Ms. Karner is responsible for innovative process design with practical implementation. Besides this, she supports her team with internal processes and organisation, and with creating training designs.